Last fall, I submitted work to a call for entries for the New England Guild of Bookworkers‘ juried exhibition. The set book was the Pictorial Webster’s: A Visual Dictionary of Curiosities by Johnny Carrera at Quercus Press, and the design was up to each participant. My binding was one of 26 chosen, and I found out last week that it was chosen (I believe by NBSS) for “best binding structure.” I am looking forward to seeing all works on display in Boston as soon as I get back to town in October! The exhibit travels to Chronicle Books on the West Coast this winter. 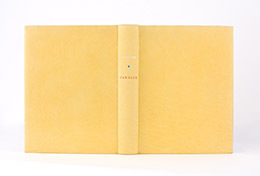 This entry was posted in News and tagged bookbinding, boston, cambridge, Chronicle Books, deFINEd BINDINGS, design binding, NBSS, NEGBW, Quercus Press, Webster's Pictorial. Bookmark the permalink. Both comments and trackbacks are currently closed. sonya! this is great news. i am so proud of you.